Glenn Miller Signed Photograph. Here is a vintage sepia matte-finish 5" x 7" photo of bandleader Glenn Miller holding his trombone, signed in blue ink. Some scattered light soiling and surface creases, otherwise in fine condition. With COA from PSA/DNA. 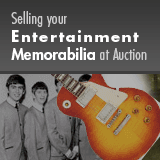 Only 34 days left to consign to the 2019 July 20 Entertainment - Dallas!